A passionate live performance of songs describing the richness of the earth and the mystery of the sea. The Neapolitan artist Flo will present her first cd called “About love and other irreversible things” in one of the most fascinating places on earth, the monumental complex of the Catacombs of San Gennaro. 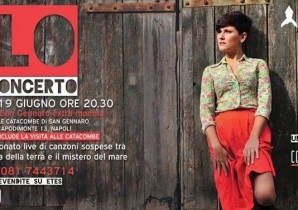 She will perform accompanied by her band: Ernesto Nobili, her producer, Michele Maione, Marco Di Palo. This unique event is a meeting point for archeology, history, music, and the local community. It will offer the possibility to discover the historical heritage of Naples, the talent of the young artists with international fame and the energy of cooperation capable of triggering strong social impact.